the Web Developer Toolbar, a free add-on for Firefox and Google Chrome. The Web Developer Toolbar can be downloaded from the Firefox add-ons website at https://addons.mozilla.org/en-US/firefox/ or the Google Chrome Extensions website at https://chrome.google.com/extensions/. the WAVE Toolbar, another free add-on for Firefox which can be downloaded from the Firefox add-ons website. 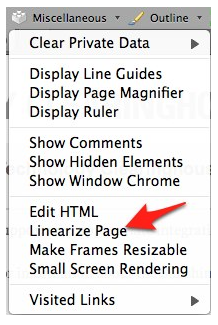 To check the reading order of a web page with the Web Developer Toolbar, select Miscellaneous, Linearize Page. This will change the layout of the page in the web browser to reflect the reading order that would be presented to screen readers and other assistive technology.To return to the original version of the web page, use the Refresh button in your web browser. 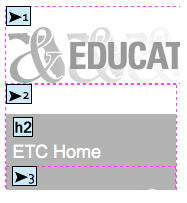 To check the reading order of a web page with the WAVE Toolbar, select Structure/Order. This will display the web page with a number of color icons overlayed on top of it. The number on the icon will indicate the reading order.